More than a thousand children in Wales starting school are classed as "severely obese," according to public health officials. For the first time, the child measurement programme has a category for super-obese four and five-year-olds. 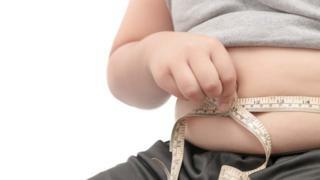 Latest figures show 3.3% of children are severely obese, described as "very worrying" by Public Health Wales (PHW). It was highest for boys and those living in the most deprived areas. Severe obesity prevalence in Wales is "significantly higher" than in England (2.36%) and is higher than in Scotland (2.7%). 26.4% of children in Wales are overweight or obese, compared to 22.4% in England. There is no nationally accepted definition for severe obesity in children; in adults it is those with a body mass index (BMI) of above 40, based on height and weight. The PHW report says it would roughly be a child heavier than 99.6 out of 100 other children of the same age. Lucy O'Loughlin, consultant in public health for PHW, said it highlighted that children currently did not have the same opportunities, with rates of obesity much higher in areas of greater social and economic disadvantage. "Childhood obesity levels in Wales are not improving, and it is very worrying that children as young as four years old are falling into the category of being severely obese," she said. "We know that once children are obese, they are at risk of getting even more obese as they get older." She said there needed to be "coordinated system-wide action" to tackle the problem or things would not get any better. It comes as the Welsh Government is consulting on its Healthy Weight, Healthy Wales strategy, which sets out ambitions to reduce obesity over the next 10 years. PHW said it recognised parents had to fight against a range of commercial and other influences, from advertising of sugary and fatty foods to affordability. Although there's been some slight improvement since last year it's obvious the proportion of children who are overweight or obese when they start school has remained stubbornly high for a number of years. If things continue as they are the Welsh Government's top doctor warns the current generation of children could well be the first to live shorter lives than their parents. The figures for the first time show us the proportion of children in Wales that are severely obese - meaning they might need ongoing monitoring, support or treatment. Rates have been creeping up and, again, there's a distinct link with deprivation, - with children from poorer backgrounds more likely to be dangerously overweight. The problem hasn't gone unnoticed. The Welsh Government's recent obesity strategy talks about making it easier for children to eat healthily in schools and nurseries, while the assembly's health committee on Thursday called for physical activity to be prioritised for young children. But it will take more than that to tackle what is being described as a "national crisis".